Are you a regular at CUESA’s farmers markets? We want to thank you! 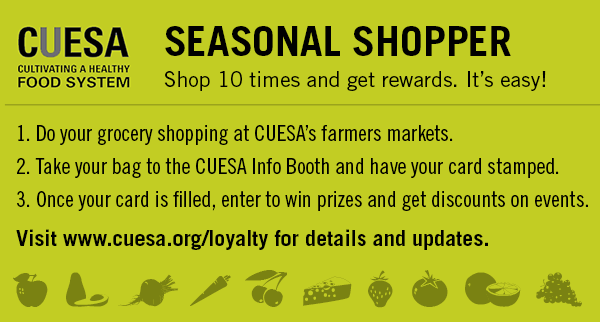 Visit the CUESA Info Booth to pick up your Seasonal Shopper card and start earning rewards for supporting your local farmers market. Do your grocery shopping at the CUESA’s farmers markets each week. Take your bag to the CUESA Info Booth and have your card stamped. Once you have collected 10 stamps, you’ll get discounts on events and be entered to win prizes. Rewards: Seasonal Shoppers receive members-only gifts and discounts on CUESA events. Drawings: Our drawings take places at the end of each month. Have your card filled and submitted at the CUESA Info Booth at 2 pm on the last market day of the month to enter to win. Prizes generally include farmers market coins, classes and event tickets, gift certificates, or other fun foodie things. Follow CUESA on Facebook and Twitter for updates on market specials and double-stamp days! *The Fine Print: Grocery bag must include at least 5 unique items. One stamp per customer per day. Card expires one year from start date.